Bright identity and signage reflect a family orientated pub which incorporates a working mill wheel, falconry and children's playgrounds. 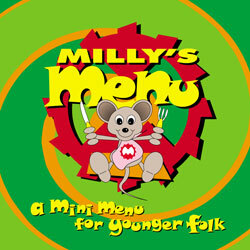 A children's character called Milly Mouse was created for children's menus and playground signage. The main menu cover was laser etched wood. See also Mill Architectural section.